Make It! + Food Trucks | .liveit.loveit.blogit. Yesterday evening I stopped by Make It! Vancouver for some shopping and snacking. If you haven’t heard of Make It!, well, it’s not your grandma’s craft show. Make It! is awesome. The vendors are amazing: products range from jewellery to ceramics to clothing to food stuffs to art to accessories. Since we are in the midst of moving, I didn’t do too much buying, but I did to lots of business-card-getting and have some ceramics and art in mind! The vibe is super fun: the show was bustling when I went at around 6:30 Friday night, DJ’s are spinning, there is a bar—should you wish to indulge in a beverage—and vendors (and sponsor tables) are super friendly. By the time I finished my shopping (there are 110+ vendors), I was hungry! Parked outside the show? Food trucks! 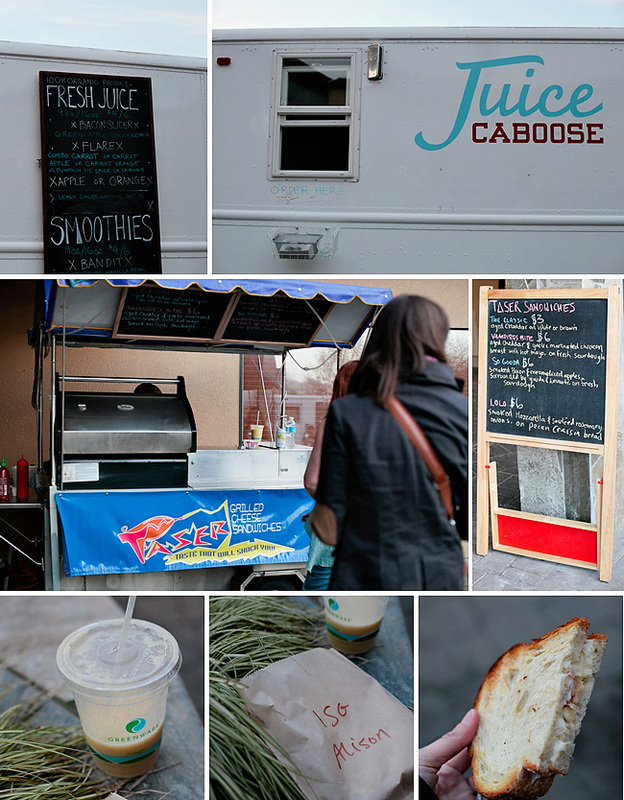 I chose Taser Grilled Cheese (156 favourites on the Vancouver Food Truck App) and The Juice Caboose (24 favourites on the app). I indulged in a $5 Special smoothie (mango, banana, hemp seeds, cardamom, and agave) and a So Gouda grilled cheese for $6 (gouda, havarti, caramelized apples, and bacon). I’ve never had cardamom in a smoothie before, and I think it is a bit of an acquired taste. However, by the end of my 16oz drink, I was loving it. Unfortunately, the girl at Taser was run off her feet; she mentioned that last year she wasn’t super busy on Make It’s Friday night, so she was underprepared (not enough food and no assistant). My sandwich could have been a bit more melty, but that being said the ingredients were delicious, and it bet if you give her a try on a regular day, the sandwiches will be awesome. I was impressed with the size of my sandwich, it was huge!